Onam dessert, originally uploaded by shashiBellamkonda. I have known VInod for many years almost 2 decades and have watched him introduce not only real tradtional Indian food but also create great fusion dishes. At lunch today he had the help and support of his mom and extended family . See the Egullet article http://forums.egullet.com/index.php?showtopic=31133 where she gives recipes and prep. hints for different indian breads. 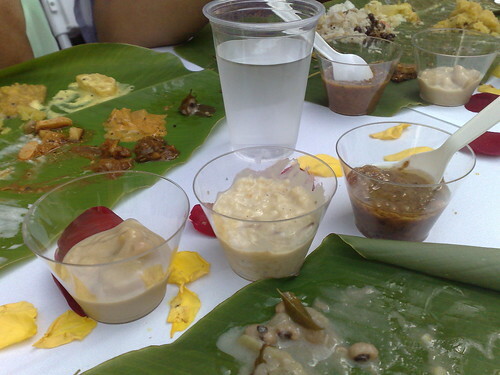 The fantastic spread included kootu, sambar, rasam, papad and 3 types of Payasam, Avial with coconut rice and 2 types of banana chips or 2 types. There was no room to ask for second helping. If you are a Indique customer I think you should ask Chef Vinod to have some special days where he can demonstrate his mastery of indian regional cuisines. I would also love to know your experiences in Indian cuisine. What was the best meal you have eaten and where? I love Indique and am also a big fan of The Delhi Club in Arlington. But for some reason, the very first time I went to an Indian restaurant in the US stands out as the best...I believe it was at the Bombay Peacock Grill out in Maryland somewhere. I didn't know most of what I was eating (it was a buffet) but I loved all of it and was hooked.